Two small grooves on jar body make you hold it more easier. Color Transparent jar body. Easy to twist, take off lid for your most convenience! Fun way to save money and keep all your loose change, a perfect gift saving pocket money for the kids! Perfect gift saving money for kids; Best Christmas present for your children! Easy to install; Size: 11.5 x 9.5 x 9cm; Material: ABS electronic components; Need 2 x AA battery (not included). If the machine cannot roll the money, open the door, upend the machine, fine the small white gear, then use a screw driver to stir it for several rounds. How to Change Password: Enter the default password 0000, open the box and hold key input for the password you want to change by # end (in 15s). Of course, you can take it without breaking it. 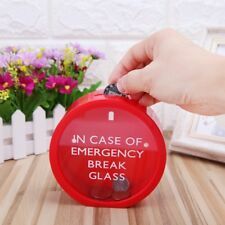 If you really need it, just break its "glass" and take out your coins! 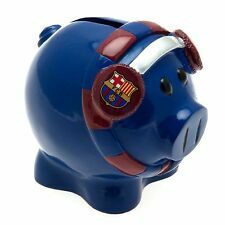 This is a uniquely designed piggy bank. Material: Plastic. 1 x Money Box. Due to the difference between different monitors, the picture may not reflect the actual color of the item. Paint is in very good condition. This bank is 100% original. What you see is what you get. 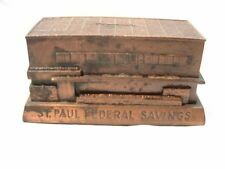 This was made by Bankers Thrift Corp advertising Second Wisconsin National Bank. No key included. High quality digital photography in our state-of-the art studio. Neat old original cast iron "Gem" Heater promotional still bank. Made in the U.s. by Abendroth Bros. c.1920's. (see photos). 1 Digital Piggy Bank. 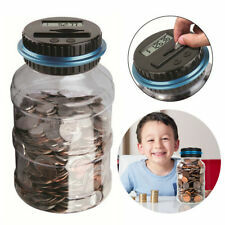 This clear jar has a LCD screen on a lid to help count your coins as they slip through the slot. Two small grooves on jar body make you hold it more easier. It also includes /- buttons on the lid to allow manual. Saving is fun with this classic piggy bank. Piggy Bank only,other accessories demo in the picture is not included. Type: Piggy Bank. 1x Piggy Bank. An adorable way to save your baby's first coins. Perfect for any nursery or kid's room. Security Safe Deposit Bank. Made in the USA by Kyser & Rex circa 1880's. 4 9/16" high x 3 3/4" wide cast iron bank is in excellent condition. The combination is included. About 90% of the original paint remains. Made in the USA by Kyser & Rex circa 1890's. 4 1/2" high nickel plated cast iron bank is in good to very good condition. The combination is unknown. The nickel plating has scattered wear and loss. Wonderful old original cast iron House Bank still bank. Made in the U.S. by J. & E. Stevens c.1915. (see photos). EXTRA NICE! Item type : Minion Piggy Bank. Size : 13.5x7x8.5cm. How to Change Password : Enter the default password 0000, open the box and hold key input for the password you want to change by # end (in 15s). The password is supported to set as you like. 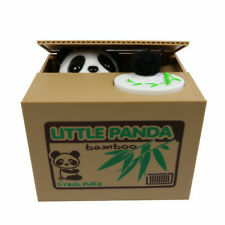 2 in 1 function: money saving box and password safe box. Calculates your money and shows the total amount of each deposit. Just slide into your coin and the digital coin counter will do the job for you! Easy to twist, remove the cover for your convenience! 1 Owl Shaped Grid Pot Piggy bank. Practical sculpture can be used to contain small changes and coins. 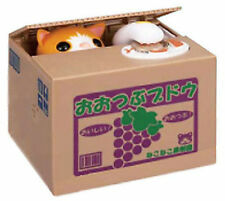 It can be used to contain coins or small changes. Practical and artistic, looks charmingly naive. New Lock Piggy Bank Money Box Code Safe Coins Cash Saving for Children Kids Gift. Pckage include: 1pc Piggy Bank. Material: Plastic. THIS IS IN OVERALL EXCELLENT CONDITION, SHOWING ONLY MINIMAL WEAR. GREAT PIECE. Automatic Recording The Deposit Developer Promotional Racine City Bank WI 2"
This particular bank is a The Deposit Developer promotional bank for Racine City Bank in Wisconsin. There are no keys for this bank. Neat old original cast iron "Kelvinator" Refrigerator promotional still bank with door that opens. Made in the U.S. by Arcade 1932 - 1934. (see photos). Security Safe Bank. Made in the USA. Manufacturer unknown. 4 1/2" high x 3 1/4" wide cast iron bank is in very good to excellent condition. The bank retains about 80% of the original paint. Displays well. Unique advertising piece. In great shape. See pics for details. WHAT A FANTASTIC LOOKING SUITCASE TIN LITHO BANK by LOUIS MARX, NEW YORK, NY. GREAT COLOR! MINOR EDGE AND CORNER WEAR. A SCRATCH ON THE BACK LOWER LEFT STRAP. OVERALL A BEAUTIFUL EXAMPLE! I DO NOT HAVE A KEY. There are no keys for this bank. High quality digital photography in our state-of-the art studio. Condition Report. Bank was tested and does record coins with 30 cents in bank. High quality digital photography in our state-of-the art studio. 1 x Piggy Bank. Plastic plug underneath for removing coins (don't need to break the pig to get coins out). Gold rough colour made from pottery. A great gift for children. Canada, United Kingdom, Austrilia, France, Germany, Spain, Ireland, Italy, Others. This is the exceptionally rare, “no key” version of the Stevens “Burglar Proof House Safe” - a version that is seldom encountered! 6" tall and 4 3/4” by 4 1/2” at the base. There is a hinged handle on the top panel and fixed, integrally cast wheels at the corners of the base. Wonderful old original cast iron "Teddy" Theodore Roosevelt bust still bank. Made in the U.S. by A. C. Williams c.1919. (see photos). Nice antique baroque vienna silver coin bank from mid 19th c, with austrian altwien 1855 hallmark. No key included. High quality digital photography in our state-of-the art studio. Piggy bank without a lid, coins slipped out at once when put it into the piggy bank. 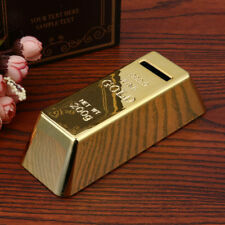 - This little piggy bank to help you solve problems lid. 1 x Piggy Bank Cover. Mini 3.5mm Wireless Bluetooth Car Kit Hands Jack AUX Audio Receiver Adapter. Antique Hubley Cast Iron Boxer Dog.. Dog in sitting position. Very good condition. From an estate sale. This cute pig shape piggy bank is the perfect bedroom decoration for boys and girls. 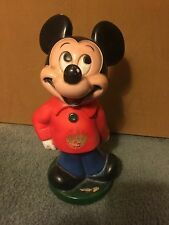 This adorable little coin bank sits perfectly on any table or book shelf. It fits almost every type of standard coin, encourages child to saving with this coin saving pot!